Last August, we told you that it looked like this could be the final year for the NBC sitcom Scrubs. Series star Zach Braff had expressed interest in moving on and thought creator Bill Lawrence felt the same way. Lawrence later said that he wanted to do another year and would probably do it even without Braff. Rumors went back and forth and in February, Lawrence confirmed that Scrubs would definitely be back for a seventh season. Lawrence said, “The reason that we have our destiny in our own control is because the show’s a dinosaur and ABC (Disney) owns 100% of Scrubs even though it’s on NBC. It’s sold into syndication, it’s doing well, so they essentially told us… I said ‘Should I be writing a series finale for the show this year?’ And they said, ‘No’ because if it’s not (picked up) on NBC, we’re gonna do another year on ABC.” Case closed, right? Nope. Though NBC hasn’t officially made their decision about renewing the series, they may be sending signals that they don’t intend to. The peacock network has been airing ominous spots promoting “the final episodes of Scrubs” and “just four episodes left.” While countdown promos are not unusual at this time of year, networks usually make it clear whether that they’re talking about the end of a season and not the end of a series. 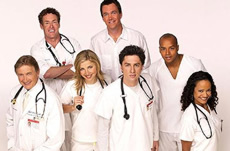 The Scrubs promos are vague yet certainly point towards the show’s demise. So if that happens, Scrubs will just move to ABC next year, right? While it once looked like a sure thing, ABC Entertainment President Steve McPherson isn’t saying that. McPherson helped to develop the series and is said to be only ‘interested’ in picking up the sitcom if it needs a home. Part of the problem could be cost. Though Scrubs consistently performs well in the ratings, a seventh season wouldn’t be cheap. In March, Braff signed a deal that would bring him $7.7 million for a full 22 episode season. NBC’s option to renew Scrubs doesn’t expire until May 16th, the day after ABC presents its fall schedule. This means ABC won’t be able to pick up the show until after filling out its own 2007-08 season. Will Scrubs find a home on either NBC or ABC? Stay tuned! 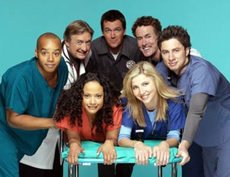 UPDATE: During the May 5, 2007 episode of Saturday Night Live, NBC promoted that there were “two episodes left until the season finale of Scrubs.” Does it mean NBC has decided to keep the sitcom? Time will tell. Thanks to Steven for the tip. I love SCRUBS! My camp nick name (was a camp nurse this summer is Scrubs) I hope it goes on, please!!! !